The Israeli prime minister Benjamin Netanyahu, who was on a five-day visit to China at the beginning of last month, picked up Shanghai as his first stop to hold a series of meetings with Chinese government leaders and business people in order to promote Israel-China trade relations. This event marked the first visit by an Israeli prime minister to China since then-prime minister Ehud Olmert’s trip in 2007. 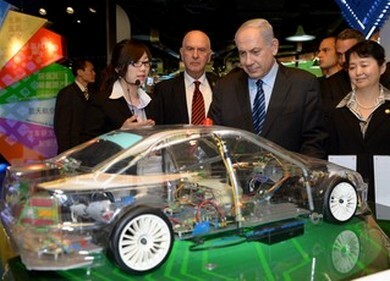 Netanyahu began his five-day China trip with the visit of the Caohejing high-tech park in southwestern Shanghai. Standing next to a wall displaying the logos of companies operating in the industrial park, he pledged to increase economic cooperation with China and vowed to strengthen the ties between the two countries in the high-tech sector. “If we create a partnership between Israel’s inventive capability and China’s manufacturing capability, we will have a winning combination”, Netanyahu said. During a meeting with Israeli and Chinese business people held after the visit of the high-tech park, Netanyahu added that in every field that he saw, there were at least 6-7 Israeli companies that could contribute. Amit Ben-Yehoshua, Senior Counsel at Da Cheng Law Offices and former member of the Board of Directors of the Israeli Chamber of Commerce in China, attended the meeting and reported that the Israeli prime minister showed great interest in promoting the trade between Israel and China. In the last years, international lawyers have witnessed increasing cooperation between Chinese and Israeli high-tech enterprises, gaining valuable expertise in cross-border licensing and investments between the two sides. Israel is a world leader in the high-tech industry. Israeli companies are developing a wide variety of technologies ranging from telecommunications to biotechnologies to medical devices and homeland security. There is no doubt that Netanyahu’s visit to China has been a cornerstone in the promotion of bilateral trade between the two countries. Netanyahu concluded the meeting by thanking the Chinese people for their present collaboration and pledged for further cooperation in the future. The fact that Israel’s prime minister picked up Shanghai as his first stop in China is everything but a coincidence. As China’s commercial, industrial and financial hub, Shanghai is on track to meet the ambitious development goals laid out in the National Development and Reform Commission’s 2011/2012 Development Report of Shanghai and to become an international financial center as well as a trade, shipping and economic center by 2020. According to the American Chamber of Commerce’s American Business in China White Paper 2013, Shanghai’s foreign trade volume amounted to US $437 billion in 2012. Exports amounted to US $207 billion, down 1.4 percent from 2011, while imports reached US $230 billion, a 1 percent increase year-on-year. Contracted foreign direct investment into Shanghai increased 3.7 percent in 2012 to RMB 525 billion. Those figures show the remarkable attractiveness of Shanghai amidst the international business community, including the State of Israel. China is Israel’s top trading partner in Asia, and the third worldwide, with bilateral trade reaching nearly US $10 billion last year. In 2012, Israel’s exports to Asia increased 5 percent while, over the same period, Israeli figures show a 6 percent and 7 percent decrease of its exports to the United States and Europe respectively compared with 2011. China’s Premier Li Keqiang told his visiting counterpart that “the new Chinese government attaches great importance to developing relations with Israel”. The two leaders decided to set up a special panel to study bilateral economic and social cooperation. In order to further promote tangible cooperation between the two countries, Li suggested to expand bilateral trade and investment, deepen technology cooperation by building industrial parks and technique transfer centers together, boost agricultural cooperation and encourage capable Chinese companies to participate in Israeli construction projects. Following their meeting, Li and Netanyahu witnessed the signing of cooperation agreements on agriculture, technology, financing and education. The Israeli leader also took advantage of his first stop in Shanghai to commemorate the friendship between two people. Netanyahu and his wife visited Shanghai’s Ohel Moshe synagogue in the city’s Hongkou district, which served as a shelter for many of the 18,000 Jews granted refuge in Shanghai during World War II. In the synagogue guest book, PM Netanyahu wrote to the people of Shanghai and the Hongkou district that the Jewish people would never forget the refuge and the kindness that they afforded them during the Nazi period, and added his greetings from Jerusalem.